The Singel Church was the epicentre of the so-called “War of the Lambs” in the middle of the 17th century (see the building’s symbol). 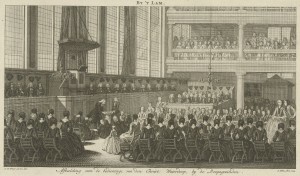 The War of the Lambs pitted leaders in Amsterdam’s Lamb congregation against one another, and members of other Dutch (and even German) congregations quickly took sides, so that the “war” ended up causing a schism that divided Mennonites until the beginning of the 19th century. At issue were congregational governance and status of the apostolic church in the current age. The conflict began in part with a dispute over leading roles Mennonites like the preacher Galenus Abrahamsz de Haan took in freethinking clubs known as “colleges” (collegie) that were held in the Lamb Church and other locations. By the late 1650s these philosophical meetings (which were open to anyone, regardless of other religious affiliations) had angered Mennonites in the Lamb congregation who believed that the Mennonites’ confessions of faith opposed loose associations and lax discipline. The resulting disputes led to an intense pamphlet war that lasted from about 1659 to 1664. 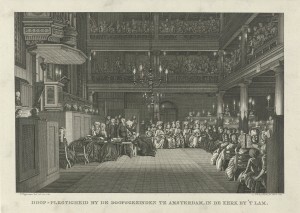 The supporters of confessional discipline were in a minority in this Amsterdam congregation. They were forced (or chose) to leave the Lamb Church in 1664, and they formed a new congregation in a building marked by the sign of a sun. The supporters of Galenus Abrahamsz and his Lamb Church loyalists became known as Lamists, and the supporters of confessional discipline and the new Sun congregation became known as Zonists (after the Dutch word for sun). 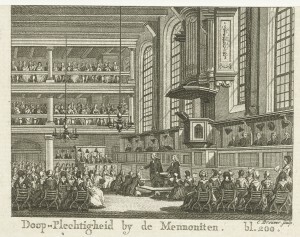 The intensity of the conflict diminished considerably by the end of the 17th century (and the theologico-philosophical characteristics of the two blocs also shifted with the generations), but the schism left a legacy of institutional division across the Dutch-speaking Mennonite world until the formation of the Algemene Doopsgezinde Sociëteit (ADS, or General Mennonite Conference) in 1811. 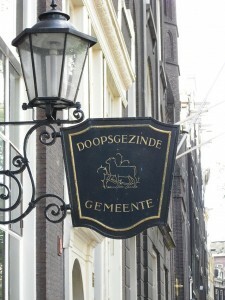 Today the Lamb Church calls itself the United Mennonite Congregation of Amsterdam. Its main symbol remains the lamb, but its internet banner includes the sun symbol of the formerly separate Sun Church. 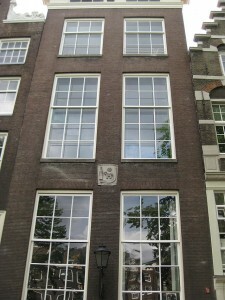 In the history of philosophy the Lamb congregation is significant, because several of its members were leading supporters of Baruch Spinoza. Jan Rieuwertsz, who played a crucial role in the survival of Spinoza’s works, is an excellent example of these Mennonite allies of Spinoza. The following images include photos from 2009 by Martin Alberts from the collection of the Stadarchief Amsterdam. Click on the links in the frames for more information. 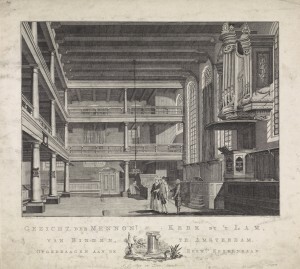 Several prints from the 18th century show the inside of the church. They provide fascinating sources for historians interested in dress, ritual life, and the relations between women and men. An organ was added above the pulpit in 1777.